Realizing an SI unit — that is, converting its formal definition into concrete reality — requires following a specific set of methods and directions called a mise en pratique, a French phrase meaning “practical application.” The BIPM specifies a mise en pratique for each SI base unit. For temperature, the procedure does not entail realizing exactly 1 kelvin, but exactly 273.16 kelvins. At present, the kelvin is realized through the triple point of water, the point at which a precise formulation of water exists simultaneously as a solid, liquid and gas when it’s in thermal equilibrium. (In other words, when the water has no net gain or loss of heat.) It is a valuable universal standard because, when this water is under a specific amount of pressure, the triple point always occurs — by definition — at exactly the same temperature. A triple-point cell is a sealed glass vessel containing water of a specific isotopic composition. Adding a mixture of dry ice and alcohol into an open well in the center of the cell causes the surrounding water to freeze into an ice mantle. The cell now contains three phases of water in equilibrium — liquid, gas, and solid. After allowing the ice to anneal (cool slowly) over a period of at least 10 days, the temperature of the triple point is measured with a standard platinum-resistance thermometer. The realization is accomplished with a triple-point cell, which consists of a pressure-sealed glass cylinder nearly filled with water. The cell is evacuated with a vacuum pump until the pressure inside is 611.657 pascals (about 0.6 percent of the air pressure at sea level). Running down the center axis of the cell is a tubular chamber open to the air. This chamber, called the thermometer well, is the space into which cooling materials are placed and a thermometer is subsequently lowered. The triple-point cell contains a very specific formulation of water. Like all atoms, the hydrogen and oxygen in water have different “isotopes” — variations of the same atom. For example, oxygen atoms exist in several forms, such as oxygen-16 (16O), oxygen-17 (17O), and oxygen-18 (18O). All these forms have eight electrons and eight protons, but they differ in their numbers of neutrons, with 16O having only eight neutrons, making it the lightest isotope, and 18O having 10 neutrons, making it the heaviest isotope. (Notice that the isotope number is the sum of the number of protons and neutrons in the atom.) Similarly, hydrogen is found most abundantly as 1H, with one proton and zero neutrons, but some hydrogen exists as 2H (one proton and one neutron), known as deuterium (D). When deuterium atoms occur in a water molecule, it’s called heavy water (D2O). Because even slight variations in the hydrogen and oxygen isotope concentrations of water can affect the triple-point temperature, the measurement science community worldwide has agreed on a specific formulation known, somewhat oddly, as Vienna Standard Mean Ocean Water. The triple-point cell is cooled by placing material such as dry ice in the central thermometer well. That causes an ice mantle a few millimeters thick to form in the water surrounding the well. 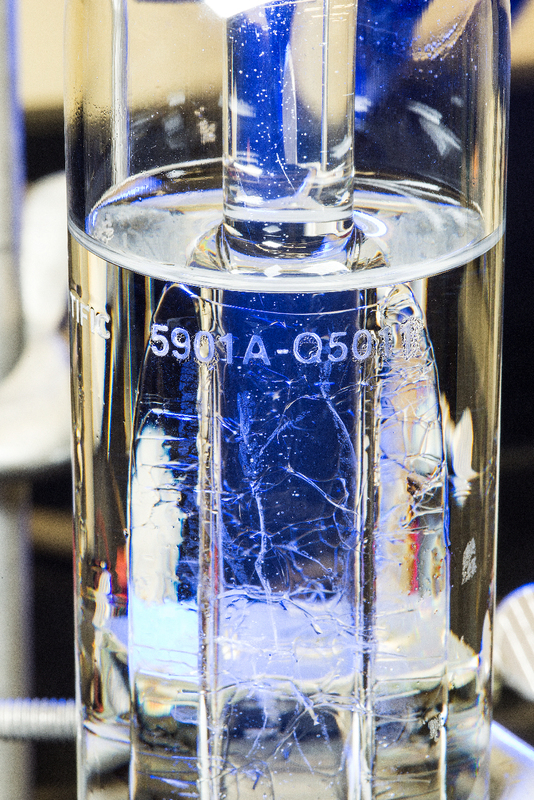 Because the mantle initially has defects and strains that can affect its temperature, BIPM’s mise en pratique says that “it is necessary to allow the mantle to anneal [slowly cool] for at least 10 days.” This is done by placing the cell in a water bath chilled to just below the triple-point temperature until the strains and cracks heal themselves. Just before the final measurement is made, a room-temperature glass rod or other device is inserted very briefly into the thermometer well. This causes an extremely thin inner melted layer to form between the outer glass wall of the well and the ice mantle, such that the mantle can rotate freely around the well. At that point, a properly prepared cell will have an interior temperature of almost exactly 273.16 K. (Among laboratory-grade cells, the range of actual triple-point temperature values is very small, approximately 50 µK, or 50 millionths of a kelvin, around this value.) Scientists insert a thermometer into the cell and allowed to come to thermal equilibrium. The thermometer’s reading is compared to the known temperature in the cell, and the results are used to calibrate the instrument. 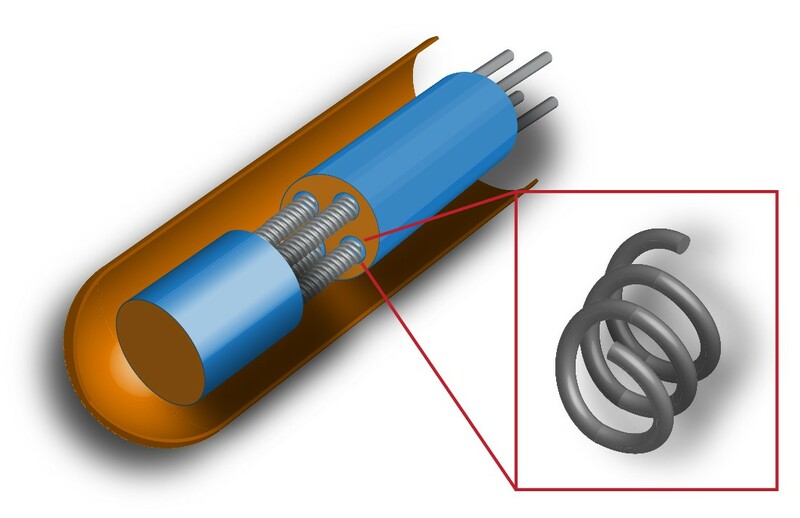 Typical platinum resistance thermometer sensor configuration, with platinum wire arrayed in coils. Typically, those calibrations are performed on standard platinum resistance thermometers, which are used to measure temperatures between -200-1,000 degrees Celsius.